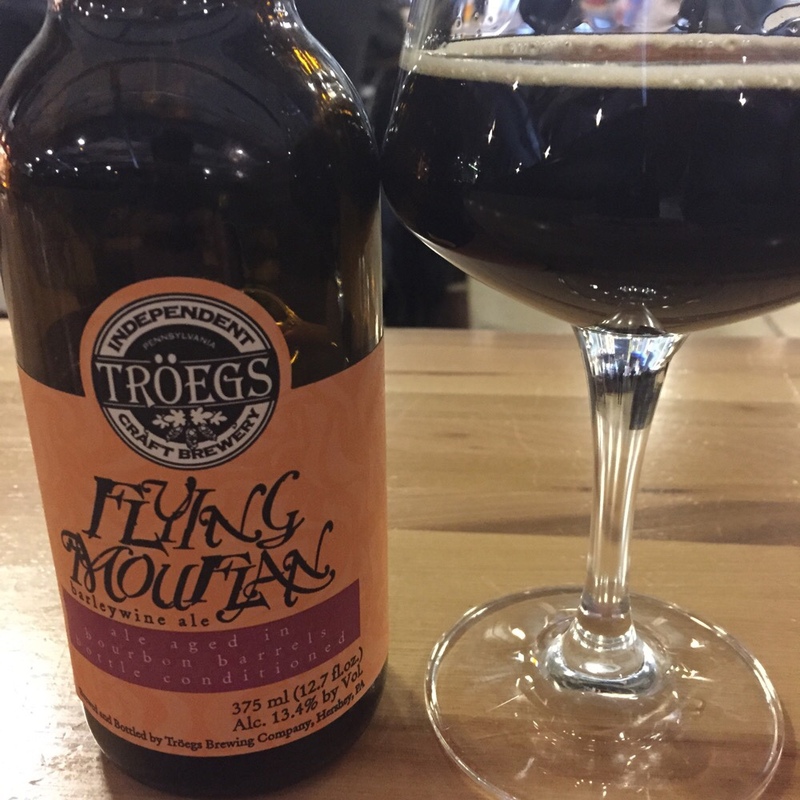 Troegs Bourbon Barrel Aged Flying Mouflan is the latest in the Troegs Splinter Series and is another fantastic release. The beer pours an opaque dark brown with hints of red tones as direct light shines through. A tan head appeared as the beer was pours into a stemmed tulip glass and the very tiny bubbles dissipated quickly. The aroma was of dried fruit covered in sweet caramelized sugars, bourbon and vanilla. As the beer warmed the nose became more prominent but never revealed the high 13.40% ABV. Mild bourbon up front with a woody sweetness. Subtle flavors of nuttiness and caramel are not over powering but easily picked up. Dried fruit as is true to style is evident. Smooth from start to finish and never drinks as big as its booziness would suggest; it’s dangerous in that way. The finish is long and invites a slow sipping experience. The thick body of this barley wine coats the palate and rewards those that take their time to fully enjoy all the complexity of this fine libation. The bourbon while pronounced never overpowers the base and is simply there to make all the best things about Flying Mouflan more pronounced. This is barrel aged beer done right. The Splinter Series continues to be my most sought after beers and this one did not disappoint in the least. I laid three of the cork & cage bottled down in the cellar and hope to see what five, ten and fifteen years does to what is without a doubt a fine beer for cellaring. I seriously wavered about buying a four pack of these but they really are exceptional.